1. Peanut Sauce: Whisk peanut butter with coconut milk, soy sauce, lime juice, honey, garlic, ginger, chilli sauce and fish sauce until smooth. If sauce is too thick, add 1 tbsp water at a time, until desired consistency is achieved. Sauce can be stored, tightly covered in the refrigerator, for up to 3 days. 2. Prepare McCain Superfries as per packaging directions. Transfer to a large bowl and sprinkle with lime zest; toss until evenly distributed. 3. Arrange fries in a large, shallow serving platter. Drizzle with mayonnaise and top with 1/4 cup peanut sauce. Scatter onions and peanuts over top. 4. Tip: Make drizzling the mayonnaise easy and impressive by spooning it into a re-sealable, plastic bag, then snip off a small piece of the corner for an instant piping bag. 1 Peanut Sauce: Whisk peanut butter with coconut milk, soy sauce, lime juice, honey, garlic, ginger, chilli sauce and fish sauce until smooth. If sauce is too thick, add 1 tbsp water at a time, until desired consistency is achieved. Sauce can be stored, tightly covered in the refrigerator, for up to 3 days. 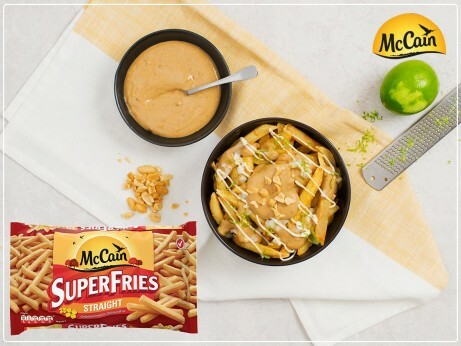 2 Prepare McCain Superfries as per packaging directions. Transfer to a large bowl and sprinkle with lime zest; toss until evenly distributed. 3 Arrange fries in a large, shallow serving platter. Drizzle with mayonnaise and top with 1/4 cup peanut sauce. Scatter onions and peanuts over top. 4 Tip: Make drizzling the mayonnaise easy and impressive by spooning it into a re-sealable, plastic bag, then snip off a small piece of the corner for an instant piping bag.